OLD ENGLISH SHEEP DOG Record Age? What is the secret to longevity ??????????????? According to recent breed health survey there have been OES (male and female) that lived to be at least 17 in the past ten years. Secret to longevity? Among other things, I'm sure: keep them lean! Many of those who don't succumb to cancer (#1 killer in our breed) seem to go due to mobility problems and any excess weight means stressing the joints. And 14-16 is a very nice age in this breed. Consider yourselves lucky. 11-12 is probably more typical. I can't believe pearl is 14! I think Madeline Erickson had a dog that lived to be 17 or 18!! 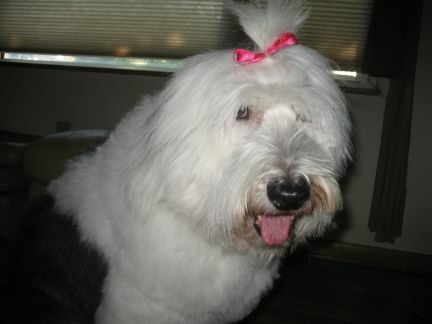 15~~~~ I am hoping that Pearl keeps healthy and 'sane' enuff for still a little (longer) while... When the other 2 starts to rough house, Pearl is always trying to get in the middle and I worry so that she will slip on the hard wood floors or one of the other clowns will jump on her and hurt her...but then I think, at least she is doing everything she wants to do..AND IF something DOES happen, she will have lived life to the fullest!!!!!!!!!!! very good attitude Val. When Max went at 13, he had been extremely active right up until 6 months before his seizures started. I am sure we could have prolonged his life a little longer - but for what, it wasn't the life he had always led and he was troubled by his inability to be mobile without help. There has been a gentleman (named KC if I recall correctly?) who has attended several NEOESR picnics who is into life extension for his dogs. He keeps them *very* thin. I met two of his one year, Weezer who was 17 and another who was (again, if I recall) 15. Weezer was up and walking! However he did seem to be confused. 18 years and 1 week old for one of ours, here is champas on her 18th birthday. 1 week later she passed away in her sleep. We also asked the question through different sources was this a record age for the breed, I got a reply back that apparently an OES in the UK lived to 22. They could not give me any details, like name of dog, how long ago etc etc, nothing followed the original reply so I dont know how factual that is as to wether it is true or not. you tell us what you feed your dogs? 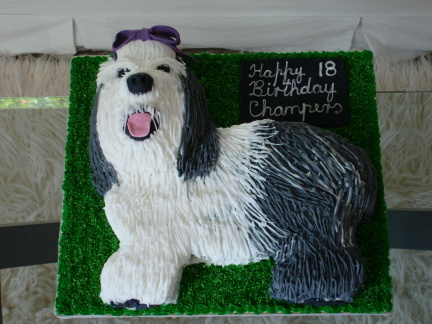 My Old english sheepdog lived to be 17. My Mac made it to his 13th birthday, 4 days later he was gone. His hind legs and hips were going.